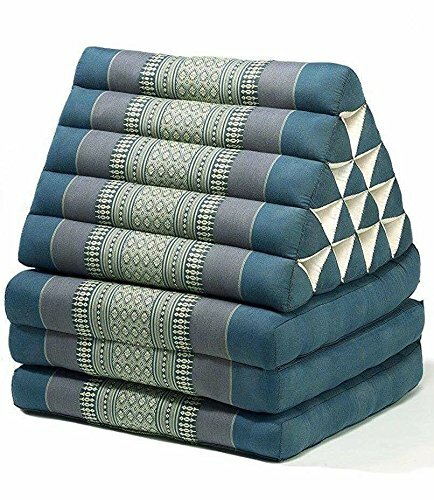 Jumbo Size Thai Handmade Foldout Triangle Thai Cushion, 73x18x3 inches, Blue Kapok Fabric, Brown Cream, Premium Double Stitched, Products From Thailand by WADSUWAN SHOP Thai Mattress at Thai City Deals. Hurry! Limited time offer. Offer valid only while supplies last. Thais is handmade Product, Our traditional three-fold Thai Mattress with triangle cushion is hand stuffed with natural kapok (a fluffy plant fibre). Thais is handmade Product, Our traditional three-fold Thai Mattress with triangle cushion is hand stuffed with natural kapok (a fluffy plant fibre). The kapok is packed to provide solid support, and yet is soft and comfort. The outer cover is made of traditional fabric with Thai design. All our Thai cushions are double-stitched for extra strength. Even folded up it makes a very attractive piece of furniture. Material: Cover: Cotton, Stuffing: Kapok. Dimensions: Length - 73 inches, Width - 18 inches, Height - 3 inches. If you have any questions about this product by WADSUWAN SHOP Thai Mattress, contact us by completing and submitting the form below. If you are looking for a specif part number, please include it with your message.